Carolyn Rafaelian is an Armenian American entrepreneur and business professional. She is the founder and CEO of the incredibly successful jewelry company Alex and Ani, as well as the owner of Belcourt Of Newport and Carolyn's Sakonnet Vineyards. Carolyn Rafaelian also has a net worth of about $1 billion. Carolyn Rafaelian is an inspirational figure for women in business and second-generation immigrants with plenty of inspirational quotes. Carolyn Rafaelian also believes strongly in a work-life balance and the value of family. Here are some of my favorite motivational business quotes from Alex and Ani CEO Carolyn Rafaelian. 1. "When we venture out, we don't always know what we will find. It's the journey that counts." 2. "There is so much beauty to be seen along the road of life. Every once in a while pull over, get out and take it all in." 3. "When you believe that you hold the destiny of your own creation, you write your own script." 4. "It's not selfish to love yourself, take care of yourself, and to make your happiness a priority. It's necessary." 5. "We are connected to each other through signs, symbols and things that resonate to our core." 6. "When you call this a lifestyle company, it's not because we throw some symbol on a piece of fashion. It's my life." 7. "Listen to your heart. It will guide you to whom you're meant to find." 8. "The truth can hurt, so we often find ourselves hearing what we want to hear. When it comes down to it though, the truth is almost always better than a lie." 9. "Instead of trying so hard to be better than everyone else, strive to be your best self." 10. "You are worthy of the life that you desire." Thanks Carolyn Rafaelian for the quality quotes to inspire epic entrepreneurs and women in business! 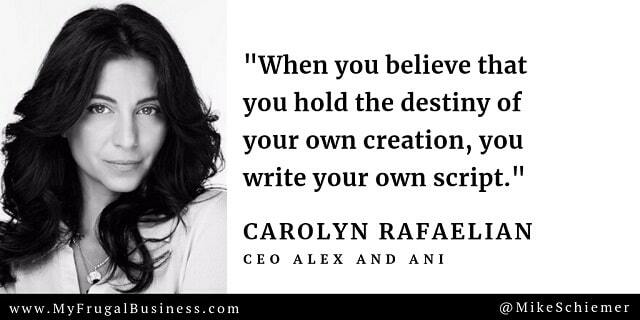 I hope you enjoyed this article about motivational business quotes from Alex and Ani CEO and entrepreneur Carolyn Rafaelian.